By Radobot, March 7, 2011 in Plugins - Publishing ONLY! I made my version of 3D Heightmap plugin. New version 1.3 has now light angle option and updated names of settings. Imagine that you are looking at uneven surface - heightmap (image in PDN). Lightness of each pixel represents it's height. You can choose from where is light coming and you can adjust the angle of light. Plugin generates how will heightmap look with your settings. It generates lightness of each pixel by calculating at which angle it is from next pixel and generating lightness of pixel form angle. Light direction - Direction from which is light coming. Brightness - Angle from which is light coming. Contrast - Strength of light. Shadows - Turns on/off shadows. 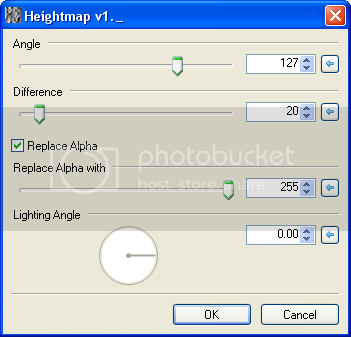 Replace Alpha - If you have image with transparent parts, this changes them all to one value. Replace Alpha with - Value, to which change all Alpha in image. Plugin is in Stylize submenu. Just ask if you want something (previous versions, code, ...) . I made new version 1.1 with angle adjustment (as you wished ) and fixed images. Now I am thinking about shadows. Sorry for not responding. I don't know how to make that lighting angle (I know how to do it mathematically, but I don't know how to write it in code). Moar updates? Tell me what do you want (except that lighting angle ). Edit: I made new version 1.2 with shadows option! New version 1.3 is available! Now it has light direction option! Thank you for helping my with this plugin ! When I program applications/plugins I usually name thing by my names because they came from my crazy ideas and I then know what they mean, so often the names aren't the best and can confuse others. Again thanks . Help? I didn't do much more than post requests xD Thanks for the great plugin! Are you planning on adding more to it in the future? Yes, help. You're saying what could be improved. I don't know if I will add something to it. I don't know what I could add/improve and be able to add/improve it. If you have any ideas? I'll then tell you if I could add it. Does this plugin work for PDN 4.0+ ? ... Texture Shader does something similar, with more (some might say, too many) options. @MJW This. rather than - (some might say, too many) ... you can't have too much of a good thing. I will take this a bit further and ask, does this plugin work with the current version of PDN which is 4.1.6? What happened when you tried to use it? Do you have any incompatibility to report? I tried it out and I don't receive any errors.